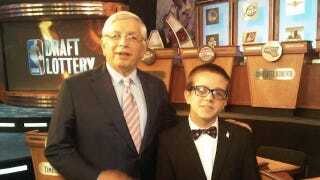 The darling of the NBA draft lottery last week was a sickly imp in a bowtie. The year before that it was a sorrowful widow in pearls. How did this come to pass? You can thank superstition (although not me for bringing you this post a week late). Sadly, too many NBA teams and executives still ignore the occult and take a rational approach to the lottery. Fools, all of them. Instead of submitting to the numerical whim of a ping pong ball machine, they should be doing EVERYTHING to help their teams win. If the lottery gods require sacrifice, you slaughter the lamb. Consider the example of Timberwolves president David Kahn, who last week made an odd conspiracy-minded Bar Mitzvah remark after little Nick Gilbert and the Cavaliers leapfrogged Minnesota to claim the first pick. Much of the subsequent chatter centered on a Semite implying the existence of a Semitic-helmed conspiracy to screw other Semites. But ragging on Kahn for such a gaucherie is unfair. People should be ragging on him for not trying to win the pick. Fate, you see, was Kahn's to control. According to a highly scientific study Deadspin conducted for a couple hours the other day, Kahn should have brought a lucky charm to the lottery to improve his chances of winning. The Timberwolves rep didn't even try. But let's focus on 2011. Our research staff crunched reams of data to identify which of the top 10 teams brought lucky charms to the lottery this year and how the baubles might have impacted the draft order. What we found was shocking. There is a direct correlation to lucky charms and luck. To understand why, let's begin by grouping the charms into four categories: 1.) family heirlooms; 2.) cornball chaff; 3.) fan-selected gimcrackery; 4.) the human totem. Of these four, the human totem is the most powerful. To be effective, however, the totem should be loosely associated with its basketball team and preferably not on the payroll. If the totem is in mourning or suffering from disease, its power grows considerably. The totem must be on stage during the lottery. A shot of rum may be left out for the totem at night. Analysis: The Cavaliers deployed the human totem this year to devastating effect. Nick Gilbert, the adorable bowtied neurofibromatosis patient and son of Cavaliers owner Dan Gilbert, will always be remembered for how he made the universe cry tears of joy and literally willed the ping pong machine to spit out a winning four-ball combo of 14-13-7-8. Take note, Kahn. Analysis: In 2010, Kahn brought KFAN sports-talk host Paul Allen. But this was an enormous mistake, as Kahn left his human totem sitting in the audience of the Secaucus studio. The Timberwolves dropped two spots in that draft thanks to the abused totem's bad juju. Far better to bring cornball chaff on stage and avoid reprisal, as Danny Granger did with his white James Bond jacket. This year, Kahn ignored all superstition and did neither. Bad move. Analysis: Unable to find a human totem, O'Connor doubled up on charms with great success. His wife picked a lucky green tie for him to wear (cornball chaff). O'Connor also donned his father's cufflinks (family heirloom). O'Connor's dad was a New York police officer, and the cufflinks displayed his badge number. Now there's an effective charm. Analysis: The human totem is wily. If Gilbert sacrificed two spots here so he could conjure his team into the first sport, are YOU going to question him? Analysis: Stupid. Colangelo doesn't believe in good luck charms: "I think I was the only one at the lottery in 2006 that didn't have a 'lucky charm,' and there were quite a few distinct items among the challengers that I recall vividly," Colangelo told the The Canadian Press in an email. "I have always found it ironic those teams holding said items that do not move up or even drop a spot or two end up going home with a 'not-so-lucky charm.'" Oh? Colangelo may have won the lottery without a charm in 2006, but then he drafted Andrea Bargnani over LaMarcus Aldridge. Analysis: Kevin Johnson may have kept the Kings in Sacramento for the next year, but he will always be a Phoenix Sun. Last week, he was also a politician, and Sacramento was accordingly punished by the supernatural. Analysis: Better than nothing. Monroe's fan-selected gimcrackery clearly preserved the Pistons from falling lower in the lottery. At least the Detroit fans have reasonably good taste: "After initially declining any lucky charms for tonight's NBA draft lottery, Monroe will heed the results of an online poll and wear a Chuck Daly pin at the event in New Jersey. The Daly pin garnered 71% of the vote at pistons.com. A Hooper key chain got 17%, and a lucky rabbit's foot got 12%." Analysis: The last time Silas played human totem was for the Hornets in 1999. He used his sorcery to move the Hornets a remarkable 10 slots up the order to the third pick, which they used on Baron Davis, a key cog on Hornets playoff teams. In 2011, Silas was less effective, mainly because he'd been sent by Michael Jordan. The explanation here is immediately apparent to anyone who closely follows luck. In 2001, Wizards assistant GM Rod Higgins was in Reagan National Airport on his way to the draft lottery in New Jersey when he saw a penny on the ground. Higgins wisely picked it up. During the lottery, he rubbed the penny for good luck. Naturally, the Wizards valuted to the top of the draft order. Enter Jordan, the president of basketball operations for Washington. Enter Kwame Brown. Exit fortune for many many years to come. In the weeks leading up to the draft lottery, Bucks.com ran a contest asking all fans to submit a few sentences on what their lucky charm is and why. The goal was to find a charm suitable for General Manager Larry Harris to take with him to New Jersey for the actual lottery. After sorting through countless entries, three winners were announced the week before the draft. Michael's charm was a fishing lure that he got from his grandpa called "Little Cleo". He claimed that it always helps him catch big fish when he uses it while fishing. But when he uses other lures, he's not as lucky. Emily's charm was a purple and white bracelet (Bucks colors at the time) that she got when she was in Cancun, Mexico. She always considered it lucky and kept it with her at all times. One day, when she was at a movie theater, she unknowingly dropped it and a random stranger came up to her and gave it back. Well, she ended up dating that "stranger" and they were together for one year at the time of the 2005 Draft. Phil told Bucks.com that he always rubbed Goro's head for good luck and that he would be happy to give it a try for the Bucks. It worked! Larry Harris was happy to add the lure and bracelet to his travel bag (for obvious reasons, Goro had to stay in Wisconsin). And on the night of the draft lottery, Larry had both charms in his suit pocket (along with another lucky charm of his own – a wooden rooster). By now you know how the story ends. A fishing lure, a bracelet from Cancun, a pug named Goro, and a wooden rooster — are you kidding me, Larry Harris? You win. Why teams don't do this every year is hard to understand. Because it works. The results of our study indicate that the teams who brought charms to the lottery this year ended up moving a collective three spots up in the draft order. The charmless teams were luckless, moving a collective three spots down. Up yours, logic.